There is no specific mention of a church in the Domesday Book, although the owner of the land, Ilbert de Lacy, claimed the ‘priest’s land’ against Bishop Remegius and in East Stoke specifically he claimed a fourth part of the vill (this priest’s land may, alternatively, have been in Elston). The present building comprises a chancel with organ chamber, nave with south aisle, a south porch, and a low, west tower. The earliest work appears in the lower part of the tower which dates from the 13th Century (tower arch jambs with later arch); the north wall of the nave may also be contemporary. Next is the chancel which has windows of 14th Century form. The south aisle was built or rebuilt in about 1738 and now has an arcade of Tuscan form columns. There were further restorations in 1874 and 1876. The tower is archaeologically complex in its fabric and has a large square, blocking at mid-south elevation. 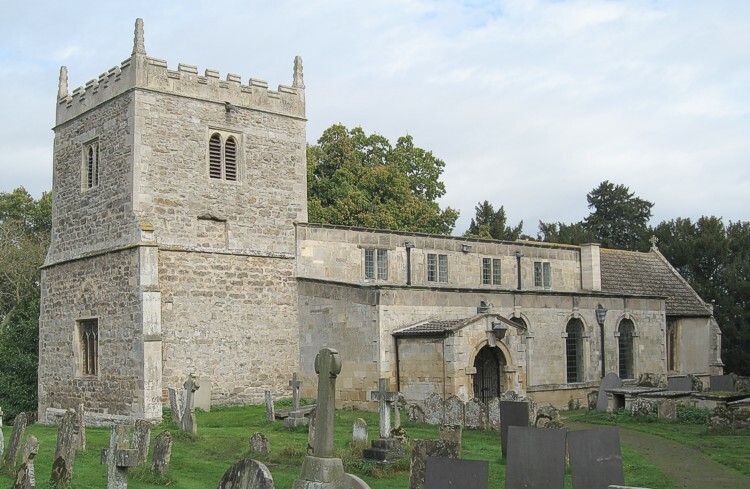 The bellframe is one of the most important in the county (an altered Elphick-S hybrid form) and supports four bells all dating from 1591 by Henry II Oldfield of Nottingham. The interior contains some medieval stained glass fragments in the south window of the chancel. Until the 1980s the nave roof had a unique form of ‘barber’s pole’ stencil decoration; unfortunately this has since been covered by modern paint. Traces of an 18th or 19th Century ‘star-form’ decoration have also been revealed under UV imagery on the clerestory window reveals. Julian Pauncefote, Baron Pauncefote, the first British Ambassador to the United States is buried in the churchyard.